Create intricate, edible details to embellish all of your delicate cakes, confectioneries, and more with this Ateco 1345 chocolate shaver! 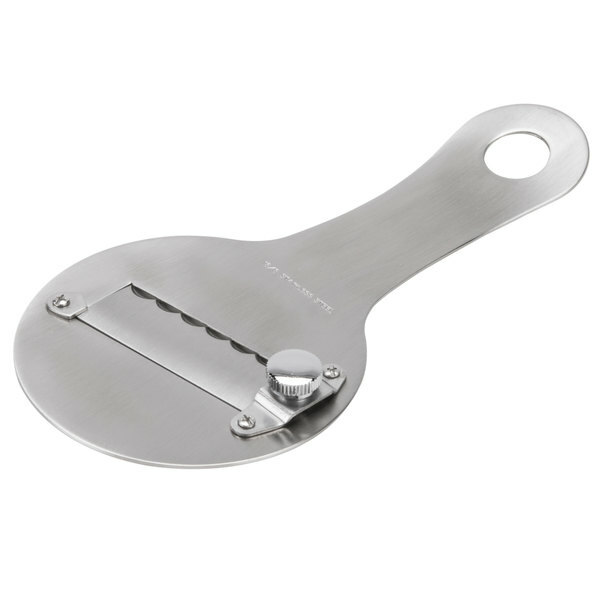 This tool is specially designed to form curls or shreds of chocolate of any size to add the perfect final touch to baked goods and desserts. 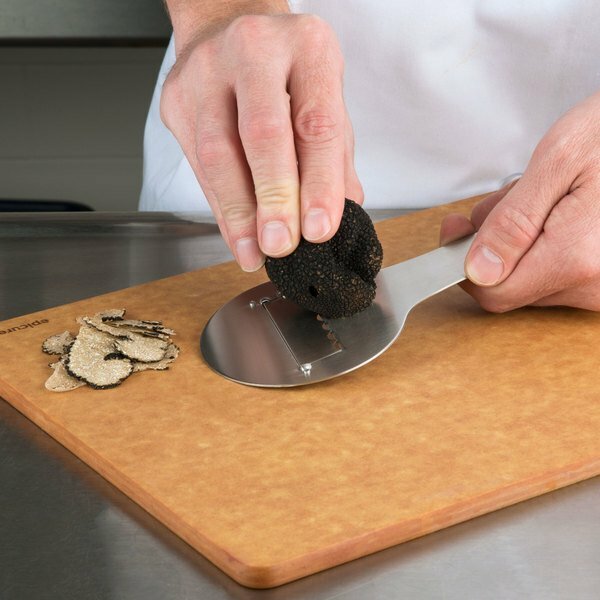 An easily-adjustable screw controls the blade, giving you complete control over the thickness of each piece of chocolate for precise use, ultimately limiting the amount of wasted product. Perfect for the holiday season or any other special event, this chocolate shaver promises you consistency and efficiency for garnishing baked goods for all your parties or catered events. In addition to sweet treats, it can be used for your culinary needs as well! 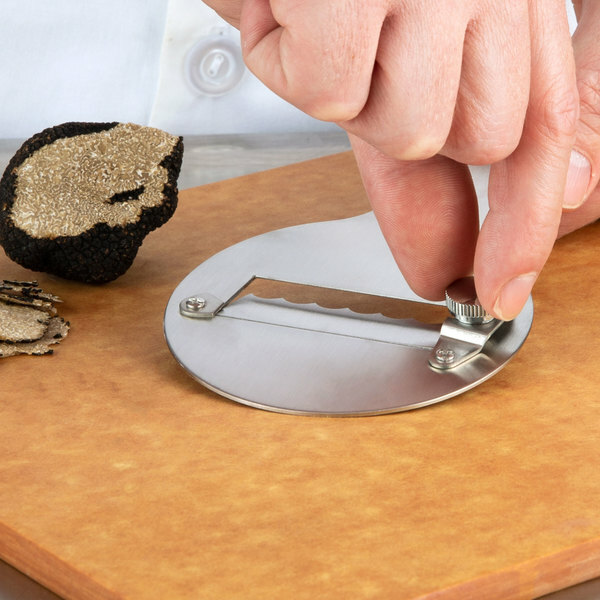 Whether you're shaving hard cheeses for pastas and salads or mushrooms for your soups and risottos, this versatile kitchen tool will take any edible presentation to the next level! Made of extremely durable 18/8 gauge stainless steel, this chocolate shaver is made to provide you a sturdy and strong grip. Its material makeup also prevents food reactions, allowing it to be used for citrus garnishes. The hole at the top allows for convenient hanging storage. This Ateco chocolate shaver is really sharp. It makes cutting chocolate really easy. It cuts perfect size slivers. The chocolate melts very evenly when I cut chocolate with this shaver. The Ateco 1345 Chocolate Shaver did the job at a price you can't beat. I just ordered another one since it worked so well! Get yours today! This hand held chocolate shaver does wonderful!!! Its si easy to use and makes perfect shaving curls for desserts. It cleans really easy and is safer than using a cheese grater!! I had high hopes for this tool. Although it stood up to the chocolate pretty well, my employees were hard on it, and broke it in less than a week. Make sure the chocolate is soft for the best curls. Cold, hard chocolate does not curl well. This chocolate shaver is easy to use and works very well. 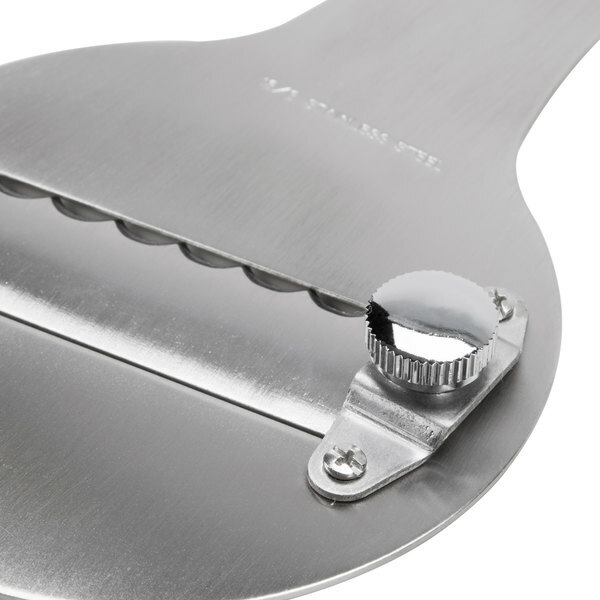 It is very slim and can also be adjusted with the turn of the screw to shave different thicknesses. Great product! Makes shaving chocolate easy and quick. Makes beautiful curls when chocolate is at the right temperature. A must have item for any bakery. I cant belive i never had this tool before! I did not know it can be so easy to make chocolate curls! This tool is like magic! 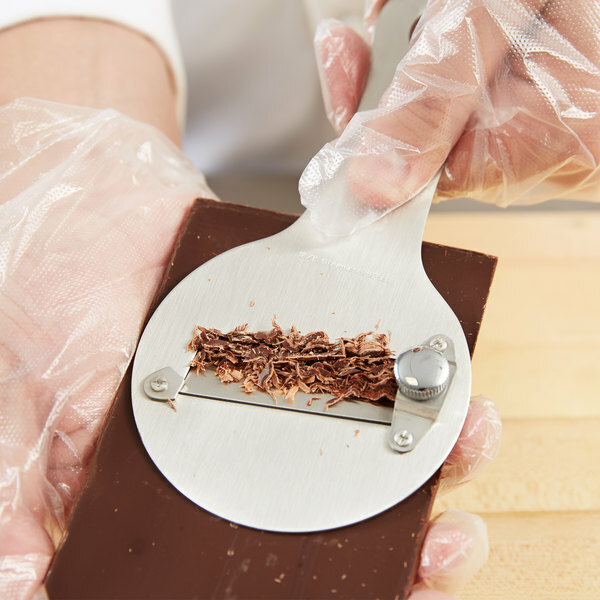 This tool is perfect for beautiful chocolate shavings on desserts! It is easy to use and easy to clean. Overall, it's a great product for the money. Perfect for shaving bars of chocolate. The Ateco 1345 came very sharp and easy to use. 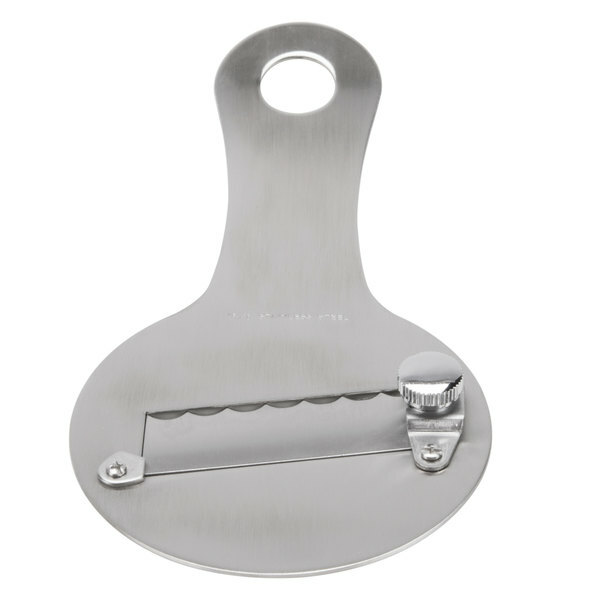 Stainless steel so no problems with rusting and nice price. The Ateco 1345 Chocolate Shaver (August Thomsen) is a nice stainless steel tool, it has some weight to it and sharp. Great price for a durable tool. Easy to use and produces great chocolate curls when the chocolate is at the right temperature. I would prefer if the handle was angled just a bit. I used this to shave a brick of milk chocolate. This was exactly what I needed to create chocolate shavings to cover my chocolate cake covered chocolate icing. I am not sure how I feel about this shaver...I am not sure if it is the shaver or my chocolate that caused problems. It has an adjustable blade, which seems like it would be handy. I used it on chocolate with a little success, but it was better with parmesan. I will try again with a different bar of chocolate. This product like everyone so far ordered from westaurant has far exceeded anything you can buy at the box stores. Finding restaurant quality at affordable prices will keep me returning again! Great tool for shaving large bars of chocolate. We use it for dark and white chocolate to make curls and shavings for decorating cakes and cupcakes. I really like the sharpness of the blade on this shaver. I was able to create thin chocolate shaves and well as thicker ones just by applying a little more pressure. This chocolate shaver works wonders!!.. Very sturdy and super easy to use. We use this in store all the time and absolutely love it. Cleaning it hasn't been a problem either and its just the right size to be able to grip firmly. The shaves turn out great we have no complaints.